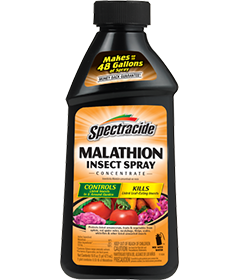 Spectracide Malathion Insect Spray Concentrate is formulated to protect listed ornamentals, fruits and vegetables from aphids, red spider mites, mealybugs, thrips, scales, whiteflies and other listed unwanted insects. Kills listed insects on roses, flowers, shrubs, vegetables and fruits. Kills listed leaf-eating insects. *Contains Xylene range aromatic solvent. DO NOT APPLY THIS PRODUCT IN A WAY THAT WILL CONTACT ANY PERSON OR PET, EITHER DIRECTLY OR THROUGH DRIFT. KEEP PEOPLE AND PETS OUT OF THE AREA DURING APPLICATION. Do not allow people or pets to enter the treated area until sprays have dried. For outdoor use around the home only. Do not use on lawns. This product is non-staining to most home siding depending on age and cleanliness. However, before using in areas where the spray may contact home siding (vinyl siding in particular), test in an inconspicuous area and re-check in a few hours. Do not use if any staining is observed. To avoid damage or poor results carefully read and follow all directions and precautionary statements. In a tank sprayer, mix the specified amounts of this product in water until the spray mixture is uniform. Spray thoroughly, covering both upper and lower leaf surfaces or other infested plant parts. Begin treating when insects first appear. For use on Azaleas, Camellias, Chrysanthemums, Evergreens and Roses. To control aphids: Mix 1½ to 2 tsp per gallon of water. To control bagworms, box elder bugs, fourlined leaf bugs, Japanese beetle adults, mealybugs, mites (red spider, spruce), rose leafhoppers, tarnished plant bugs, thrips, whiteflies, woolly aphids: Mix 1 Tbsp per gallon of water. To control scales (black, oyster shell, soft brown): Mix 1½ to 2 Tbsp per gallon of water. For control of oak kermes and scales (juniper, fletcher): Use 2 tsp per gallon of water. NOTE: Do not use on Boston, Maidenhair or Petris Ferns, as well as species of Crassula. Do not apply to Petunias. Apricots: Make up to 2 applications per year – at least 7 days apart. Do not apply within 6 days of harvest. Cherries: Make up to 4 applications per year – at least 3 days apart. Do not apply within 3 days of harvest. Grapes: Make up to 2 applications per year – at least 14 days apart. Do not apply within 3 days of harvest. Peaches: Make up to 3 applications per year – at least 11 days apart. Do not apply within 7 days of harvest. Strawberries: Make up to 4 applications per year – at least 7 days apart. Do not apply within 3 days of harvest. To control aphids, mix 1½ to 2 tsp per gallon of water. To control fourlined leaf bugs, grape leafhoppers, Japanese beetle adults, leafrollers (fruit tree, red-banded, strawberry), mealybugs, moths (bud, codling), pear psyllids, plum curculio, red spider mites, tarnished plant bugs, tent caterpillars, thrips, whiteflies and woolly aphids, mix 1 Tbsp per gallon of water. To control scale crawlers, mix 1½ to 2 Tbsp per gallon of water. NOTE: Malathion may cause injury to Ribier grapes. Grapefruit, Lemons, Limes, Oranges and Tangerines: Make up to 3 applications per year – at least 30 days apart. Do not apply within 7 days of harvest. To control aphids and scales (black, Florida red, purple, yellow), thrips and whiteflies, mix 2 tsp per gallon of water. Thorough coverage of branches and upper and lower leaf surfaces is necessary to control insects. Do not apply during full bloom. Beans: Make up to 2 applications per year – at least 7 days apart. Do not apply within 1 day of harvest. Broccoli, Brussels Sprouts, Cauliflower: Make up to 2 applications per year – at least 7 days apart. Do not apply within 2 days of harvest. Cabbage: Make up to 6 applications per year – at least 7 days apart. Do not apply within 7 days of harvest. Kale: Make up to 3 applications per year – at least 5 days apart. Do not apply within 7 days of harvest. Lettuce (head): Make up to 2 applications per year – at least 6 days apart. Do not apply within 14 days of harvest. Lettuce (leaf): Make up to 2 applications per year – at least 5 days apart. Do not apply within 14 days of harvest. Peas: Make up to 2 applications per year – at least 7 days apart. Do not apply within 3 days of harvest. Potatoes: Make up to 2 applications per year – at least 7 days apart. Do not apply within 0 days of harvest. Radishes: Make up to 3 applications per year – at least 7 days apart. Do not apply within 7 days of harvest. Squash (summer and winter): Make up to 3 applications per year – at least 7 days apart. Do not apply within 1 day of harvest. Tomatoes: Make up to 4 applications per year – at least 5 days apart. Do not apply within 1 day of harvest. 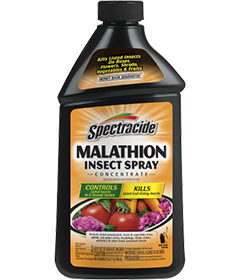 To control fourlined leaf bugs, Japanese beetle adults, leafhoppers (bean, potato), mealybugs, red spider mites, tarnished plant bugs, thrips and whiteflies, mix 1 Tbsp per gallon of water. Pesticide Storage: This product should be stored in the original unopened container in a secure, dry place. Do not contaminate with other pesticides or fertilizers. The product should never be heated above 55°C (131°F), and should not be stored for long periods of time at a temperature in excess of 25°C (77°F). Pesticide Disposal: To avoid wastes, use all material in this container by application according to label directions. If wastes cannot be avoided, offer remaining product to a waste disposal facility or pesticide disposal program (often such programs are run by state or local governments or by industry). Never place unused product down any indoor or outdoor drain. Container Disposal: Nonrefillable container. Do not reuse or refill this container. Place in trash or offer for recycling if available. CAUTION. Harmful if swallowed. Harmful if absorbed through skin. Causes moderate eye irritation. Avoid contact with skin, eyes, or clothing. Wash thoroughly with soap after handling. Remove and wash contaminated clothing before reuse. Wash hands before eating, drinking, chewing gum, using tobacco, or using the toilet. If Swallowed: Immediately call a Poison Control Center or doctor. Do not induce vomiting unless told to by a Poison Control Center or doctor. Do not give any liquid to the person. Do not give anything by mouth to an unconscious person. NOTE TO PHYSICIAN: This product contains a cholinesterase inhibitor. Atropine is antidotal. 2-PAM may also be given in conjunction with Atropine. May pose an aspiration pneumonia hazard. Contains petroleum distillate. To protect the environment, do not allow pesticide to enter or run off into storm drains, drainage ditches, gutters or surface waters. Applying this product in calm weather when rain is not predicted for the next 24 hours will help to ensure that wind or rain does not blow or wash pesticide off the treatment area. Rinsing application equipment over the treated area will help avoid runoff to water bodies or drainage systems.